Finally we have a few Top 16 memebers proceeded today to the Last 16 of PTC5 in Sheffield. Neil Robertson had a great day today after his victory over Ding Junhui on Thursday night on the week 3 of Premier League. Robertson started off the day with whitewashing Eden Sharv before facing the real challenge from Aditya Metha. Metha beaten Ali Carter 4-0 to set up a meeting with Robertson. Metha threatened Robertson on his way to last 32 and Robertson eventually saw him off in the decider. 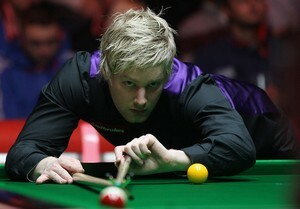 Robertson defeated Scott Mackenzie 4-2 to proceed. Robertson is facing the Chinese Boy Li Yan who saw off Judd Trump 4-1 in last 16. Higgins had an easy to win and made last 16 by three comfortable wins, 4-0 over David Grace in first round, 4-2 over Michael Wasley in the second and his fellow countryman Alan McManus 4-1 in the last 32. Higgins will have an interesting clash with Ryan Day in last 16, who beaten Kyren Wilison and Kurt Maflin previously. Legends Steve Davis and Jimmy White both could not go further to last 16. They were stopped by Michael Holt and Martin Gould respectively. Michael White and Barry Hawkins were last two men who are through at about 2am. M. White had an impressive victory over Shaun Murphy on the last PTC4 in Germany. Hope he will continue his good run on Sunday.